The biggest man in the room. Today is Grandpa’s birthday. He would have been a hundred and something. Remember when we’d go over there on this day? Grandma always made ham sandwiches and Grandpa gave the presents. He’d bring out shopping bags full of his bargain basement finds – costume jewelry and ice skates and celebrity-themed knick-knacks. 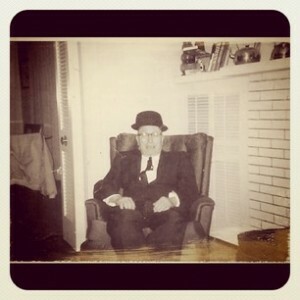 Grandpa was a retired El train conductor who then took a job at Cannonball Messenger Service. This is back when they used foot messengers in addition to bikers, mostly for Loop runs. His retiree’s CTA pass was a bonus for Cannonball because they didn’t have to reimburse his travel, but he warned them, “My mind is made up. When I turn 80, I’m retiring for good.” His 80th birthday came and he kept his word. He couldn’t believe they didn’t put up a fight. It kind of hurt his feelings. From 80 on, Grandpa left the house each morning with empty shopping bags, and travelled the city filling them up. He’d ride downtown to the Marshall Field’s basement, to the D’Amatos on Grand and May for his favorite bread, to Woolworths in Oak Park, to Maxwell Street, to some bakery in Belmont-Central for Grandma’s favorite pound cake. He knew all the El and bus routes, and knew people in every neighborhood. Years later, at his wake, the strangest people showed up. I reached my hands into the bag, pulling out fistfuls of necklaces and bracelets. All mine, as many as I could hold. It was a very, very good birthday. I love, love, love stories about people’s family members like this. Happy Birthday Grandpa! Thanks Mare. Happy birthday to “The Champ”.